Charlie Brown and his friends have had a large presence in our pop culture since the comic strip started in 1950. So understandably expectations were high for Blue Sky Animation's The Peanuts Movie (2015) and I'm happy to say that the studio clearly met audience expectations as well as introduced Charlie Brown to a new generation of fans in an entertaining and fantastic fashion. 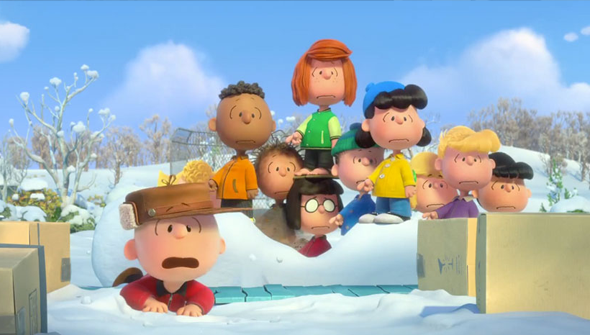 The film follows Charlie Brown as he sets out to gain the attention of his new neighbor, the Little Red-Haired Girl, by changing himself from a loser to a winner. Brown's story is paralleled by Snoopy's type-written adventure tale consisting of his battle with the villainous Red Baron and daring rescue of his paramour, Fifi. This parallel serves to emphasize Charlie Brown's story as well as work as a clever metaphor. In true Charlie Brown fashion, Brown messes up nearly every attempt to gain the Little Red-Haired Girl's attention and of course experiences multiple episodes of dejection. It is through these attempts that Charlie Brown eventually learns an important lesson that is relatable for anyone at any age and packs a beautifully emotional punch. While the story does fall flat in a few areas and sometimes feels like an overly bloated holiday special, it does entertain and is chock full of callbacks to previous specials as well as fan favorite running gags. Hint: stay after the initial credits for a fantastic scene that pays homage to one of the longest running and most hilarious gags. Nearly every character in the canon makes an appearance and the film pays a large amount of respect to its history while creating a new story to entice a new generation of fans. One of the most fantastic aspects of the film is how the original style of Charlie Brown is retained and yet updated at the same time for a new audience. It's clear while watching the movie that you are indeed watching a Charlie Brown movie due to the artistic style as well as the voice acting, however, the CG provides a fresh update and visually stunning detail that makes Charlie Brown fit into our modern age of animation. Overall The Peanuts Movie is one that Charles Schulz would surely be proud of. It celebrates the history of Charlie Brown while providing a fresh new take on Brown and his friends. It's evident that we may even see a franchise come out of this movie, which is one franchise that I know I would gladly welcome. With fantastic animation that retains the classic style with a modern update, fun music including a catchy tune from Meghan Trainor, and lessons that ring true for anyone regardless of age, The Peanuts Movie is one to take the family to see and enjoy together.